What do the different pastry tube numbers mean? To ensure you choose the right sized pastry tip for the job, most Ateco pastry tubes feature numbers, starting at #0. The number indicates the relative size of each Ateco tip in comparison with the tube type. For example, French star #0 is the smallest tip available, while French star #9 is the largest tip size available for this tube type. Create deeply-grooved icing patterns on your cakes, cupcakes, pies, and more with this Ateco 844 3/8" closed star #23 pastry tube. Made of durable stainless steel, this tube is rust-resistant and designed to withstand repeated use without bending out of shape. 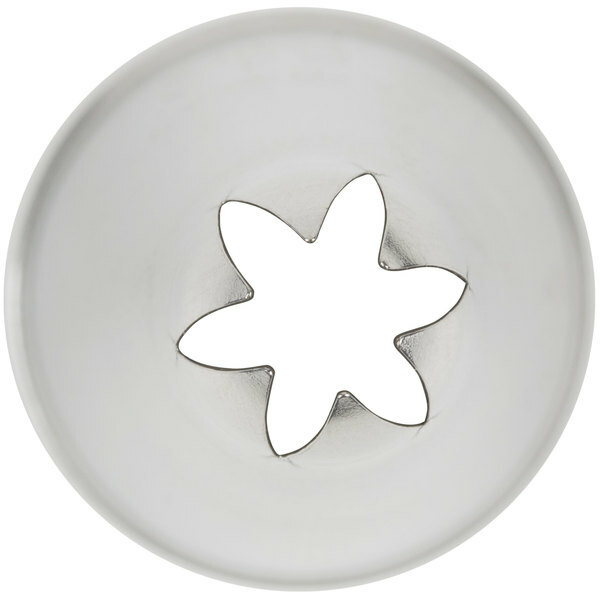 Featuring a closed star tip, you can create shells, stars, fleur-de-lis, rosettes, and flowers. The closed star design produces a defined texture for eye-catching bakery decorations. Plus, its medium size is perfect for icing confectionary creations quickly and efficiently. 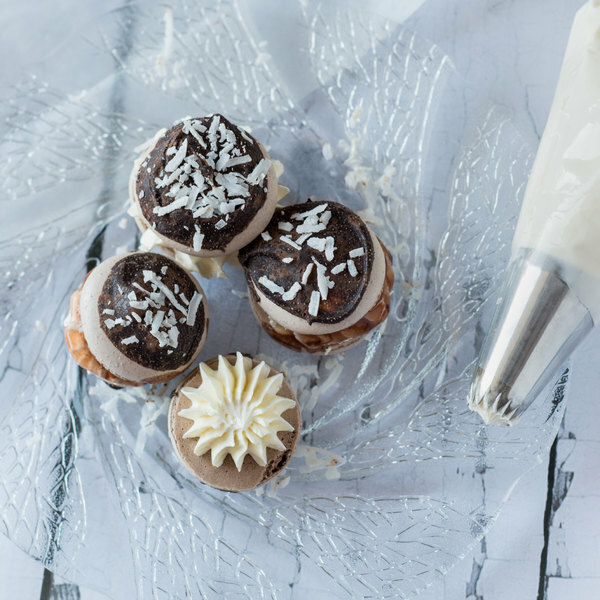 Using the right sized pastry tube for the job will enhance your presentation to draw patrons' attention to your display cases and plated desserts. 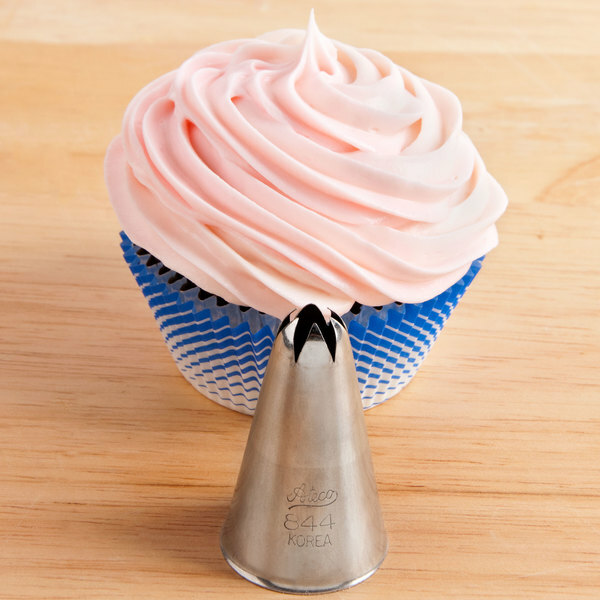 I love these large tips for piping my cupcakes as well as Cake borders. They look great and will be purchasing more soon. I recommend them. I love using this Ateco 844 #23 Closed Star Piping Tip (August Thomsen) to make borders and little rosettes on my baked products. It gives my products a finish and professional look. These are very good quality, you can either hand wash them or just put them on dishwasher. The price is fantastic too! I like these tips they are large and perfect to decorate any sized cupcake. When I’m finished I just pop them in the dishwasher for easy clean up. A quick swirl around a cupcake and I’m on to the next task with this pastry tube. It’s a good size for this as well as other similar task. Ateco 844 3/8" Closed Star #4 Pastry Tube (August Thomsen) is a GREAT product that's inexpensive and did exactly what I need it to do in the kitchen! 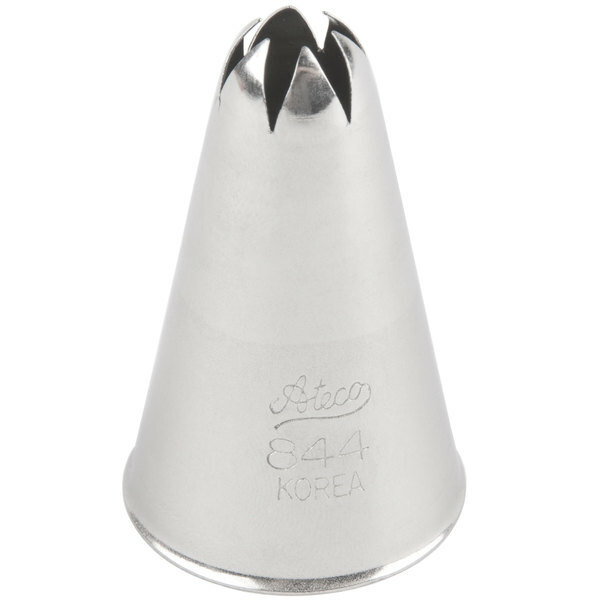 These ateco 844 3/8 close star number four pastry tube tips are yet again another quality product that make decorating pastries,cupcakes,cakes,cookies and candy a simplicity! The Ateco 844 3/8" Closed Star #4 Pastry Tube is great for decorating cupcakes. The quality is excellent and the price is very reasonable. This is also one of my favorites and I would purchase again if needed. One of the standard sizes for must have tips. This tip is great for basic cake decorating and icing use. Another high quality great price tip. This pastry tube is amazing. It makes life so much easier when decorating your most fabulous cakes! It releases icing smoothly into its beautiful textured decal. My favorite tip to use. Great price, and pretty fool price to use- and great for teaching classes with, would recommend to beginners for sure! Ateco tips are solid and keep their shape. With the smaller sizes, #4 and lower numbers, that's important. Sometimes when using a stiffer frosting, other tips will lose their shape. This Ateco one does not. And we use our pastry tips daily! The #4 tip is great for piping rosettes on smaller cakes and for smaller cupcakes. The Ateco 844 closed star pastry tube was excactly what we were looking for to do our piping. Always great products at amazing price on here. This Ateco 844 3/8" Closed Star #4 Pastry Tube (August Thomsen) is perfect to decorate your cakes, cupcakes, pies, desserts...It's also great to fill your cupcakes and doughnuts....I highly recommend this pastry tube. I loved the control these tips gave for decorating cupcakes . They worked wonderfully. Only draw back was I did not have a coupler set large enough to use. The disposal decorating bag I used worked well without. Ateco is by far the best brand for baking supplies. For such a low price, you get an amazing quality product! This is perfect for cupcakes. Add detail to the top of cakes with the #4 pastry tube from webstaurant. This tube works perfect for those needes and is easy to clean.